In my Freeman article "TV’s Third Golden Age," the summary subtitle that the magazine chose was "Programming quality is inversely proportional to regulatory meddling." I couldn’t have said it better. But does that mean that everything the FCC does makes television worse? All laws and regulations have unforeseen consequences. That usually means unintended damage, but there’s no law of history that says every unplanned outcome is pernicious. If you’re an advocate of a free society — one in which all arrangements are voluntary and there is the least coercive interference from governments or other thugs — history will present you with an unending series of conundrums. Whom do you side with in the Protestant Reformation, for example? The Catholic Church banned books and tortured scholars, and their official structure is one of hierarchy and authority. Easy enemy, right? Clear-cut bad guy. But the Church had kept the State in check for centuries — and vice versa, permitting seeds of freedom to root and flourish in the gaps between power centers. Whereas the Protestant states tended to be more authoritarian than the Catholic ones, with Luther and Calvin (not to mention the Anglicans) advocating orthodoxy through force. There’s a reason all those Northern princes embraced the Reformation: they wanted a cozier partnership of church and state. This is certainly not the history I was taught in my Protestant private schools. Similarly, most of us were schooled to side with the Union in the Civil War, to see Lincoln as a savior and the Confederacy as pure evil. But as much as the war may have resulted, however accidentally, in emancipating slaves, it also obliterated civil liberties, centralized power, strengthened central banking and fiat currencies and — to borrow from Jeffrey Rogers Hummel’s great book title — enslaved free men. Reading history without taking sides may fit some scholarly ideal (actually, it seems to be a journalistic ideal created by the Progressive Movement to masquerade their views as the only unbiased ones), but it is not a realistic option. We cannot do value-free history. If we try, we instead hide or repress our biases, which makes them a greater threat to intellectual integrity. Neither can we say, "a plague on both their houses," and retreat to the realm of pure theory, libertarian or otherwise. We have to live in the real world, and even if we are not activists or revolutionaries, the same intellectual integrity that must reject "neutrality" also requires that we occasionally explore the question of second-best or least-evil options. I remember several years ago, when my very libertarian boss surprised me by speaking in favor of increased regulation of banking. His point was that the banks were not free-market institutions; they were government-created cartels enjoying a political privilege that protected them from the consequences of the market while they surreptitiously depleted our property and spoiled the price system that drives all progress in the material world. Ideally, he’d want the government out of banking altogether, but in the meantime having them do less damage was better than letting them do more. 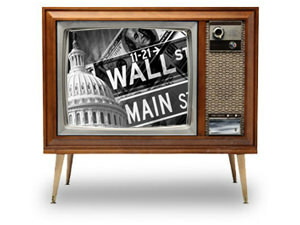 It may seem anticlimactic to follow the Reformation, Civil War, and fractional-reserve banking with a little-known FCC rule about TV programming from almost half a century ago, but I’ve been reading television history for a while now (1, 2, 3, 4) as illustrative of larger patterns in political history. The Prime Time Access Rule (PTAR) was a law instituted in 1970 to limit the amount of network programming allowed during TV’s most-watched evening hours. But a libertarian could easily jerk his or her knee in the opposite direction. How dare the central government tell private station owners what they can and can’t air on their own stations, right? The problem with such an ahistorical take on the issue is that broadcast television was a creature of the state from the beginning. Radio may have had a nascent free-market stage in its development, but television was a state-managed cartel from the word go. So am I saying that PTAR was a good thing? Is it like the possibly beneficial banking regulations imposed on a cartelized banking system? Should we view CBS versus FCC as the same sort of balance-of-power game that Church and State played before the early modern period of European history? Maybe, but that’s not why I find PTAR an interesting case for the liberty-minded historian. As is so often the case with laws and regulations, PTAR’s main legacy is in its unintended consequences. "Despite the best of intentions," writes historian Gary Edgerton in The Columbia History of American Television, "the PTAR failed in almost every respect when it was implemented in the fall of 1971." [P]ractically no local productions or any programming innovations whatsoever were inspired by the PTAR. In addition, any increase in independently produced programming was mainly restricted to the reworking of previously canceled network series, such as Edward Gaylord’s Hee Haw and Lawrence Welk’s The Lawrence Welk Show.… Rather than locally produced programming, these kinds of first-run syndicated shows dominated the 7 to 8 P.M. time slot. This renaissance of recently purged rural programming was certainly not the FCC’s goal, but the creation of the first-run-syndication model is one of the great unsung events in media history. A quick note on terminology: to the extent that I knew the word "syndication" at all when I was growing up, I took it to be a fancy way of saying "reruns." For example, Paramount, the studio that bought the rights to Star Trek after the series was cancelled, sold the right to rerun the program directly to individual TV stations. When a local TV station buys a program directly from the studio instead of through the network system, that’s called syndication. But syndication isn’t limited to reruns. Studios created first-run TV programs for direct sale to local stations as far back as the 1950s, but they were the exception. The dominant syndication model was and is reruns. But two events created a surge of first-run syndication: (1) PTAR, and (2) the rural purge I obliquely alluded to above. I write about the rural purge here, but I’ll summarize: as the 1960s turned into the 1970s, television network executives did an about-face on their entire approach to programming. In the 1960s, each network tried to win the largest possible viewership by avoiding controversy and appealing to the lowest common denominator in public tastes. This meant ignoring the rift between races, between generations, and between urban and rural sensibilities — what we now call red-state and blue-state values — in the ongoing culture wars. This approach was dubbed LOP (Least Objectionable Program) theory. By the end of the decade, however, NBC vice president Paul Klein (who had christened LOP theory just as its tenure was coming to an end), convinced advertisers that they should stop caring so much about total viewership and focus instead on demographics, specifically the Baby Boomers — young, politically radicalized, and increasingly urban TV viewers — who were most likely to spend the most money on the most products. CBS was winning the battle for ratings, but Klein pointed out that their audience was made up of old folks and hicks, whereas NBC was capturing the viewership of the up-and-comers. Klein may have worked for NBC, but it was CBS who took his message to heart, quite dramatically. In 1970, the network rocked the TV world by cancelling its most reliably popular shows: Petticoat Junction, Green Acres, The Beverly Hillbillies, Mayberry RFD, Hee Haw, Lassie, and The Lawrence Welk Show. CBS, in an effort to appeal to a younger audience made socially conscious by the turbulent 1960s, had dumped its hit rural comedies in the first years of the 1970s while their aging audiences were still placing them in Nielsen’s top twenty-five. Critics, who for the most part had loathed the likes of Petticoat Junction and Gomer Pyle, loved some of what replaced them. I loved what replaced them, too: Mary Tyler Moore, All in the Family, M*A*S*H, and the like. "Several members of Congress," Wikipedia informs us, "expressed displeasure at some of the replacement shows, many of which … were not particularly family-friendly." But that was the point: the networks were no longer aiming to please the whole family: just the most reliable consumers. But despite capitalism’s cartoonish reputation for catering only to the bloated hump of the bell curve, that’s not how the market really works. It is how a cartel works, and the broadcast networks behaved accordingly, both before and after the rural purge. In the 1950s and ’60s, they aimed for the largest possible viewership and to hell with minorities of any sort. The demographic revolution changed the target, but not the tactic: aim for the big soft mass. That’s certainly how the big players would behave in a free market, too, but the telltale sign of freedom in the economy is that the big players aren’t the only players. Fortunes are made in niche markets, too, so long as there aren’t barriers to entering those niches. As I’ve said, TV is descended from radio, and Hoover and his corporatist cronies had arranged it so that there could only be a few big players. That’s where we come back to the FCC’s Prime Time Access Rule of 1970. PTAR created a hole at the fringe of the prime-time schedule, just as the rural purge was creating a hole in the market. All those fans of Hee Haw and Lawrence Welk didn’t just go away, and they didn’t stop spending their money on advertised products, either. Before PTAR, the multitude of fans of "rural" programming would have had to settle for mid-afternoon reruns of their favorite shows (the way Star Trek fans haunted its late-night reruns around this same time). But the rural fans didn’t have to settle for reruns, and they didn’t have to settle for mid afternoons or late nights. They could watch new episodes of Hee Haw or Lawrence Welk at 7 PM. In fact, those two shows continued to produce new episodes and the local stations, which were no longer allowed to buy from the networks for the early evening hours, bought first-run syndicated shows instead. The Lawrence Welk Show, which had started in the early 1950s, continued for another decade, until Welk retired in the early ’80s. And the repeats continue to run on PBS today. Hee Haw, believe it or not, continued to produce original shows for syndication until 1992. I loved Mary Tyler Moore, and I didn’t care so much for Lawrence Welk, but what I really love is peaceful diversity, which cannot exist in a winner-takes-all competition. The rise of first-run syndication was a profound crack in the winner-takes-all edifice of network programming. This idea of "narrowcasting" is the basis of quality in entertainment (and freedom in political economy, but that’s another story). I’m not out to sing the praises of the FCC for increasing economic competition and cultural diversity — these consequences were entirely unintended — but we do have to recognize PTAR as a pebble in Goliath’s sandle, distracting him for a moment from David’s sling. Is it still in place? It sounds like the rule assumes prime time is 7-11. In the Eastern Time Zone, the local station programming is 7-8, and network shows are 8-11. But in the Central, the network shows are 7-10. That’s typically followed by 35 minutes of local “news,” then back to network programming (Kimmel, Letterman, Fallon). That means only 35 minutes of local programming, instead of an hour. Or does the FCC assume that that simple Midwest farm folk’s prime time is 6-10? If so, why would it assume so? What is this? There is no “least interference from governments” in a free society. There is NO govenrment!! How are increased banking regulations ever a good thing? This implies that the state has the authority to roll back, change, enhance etc said regs later on and all the bad effects stay in place, only with bigger banks and government. Just pure insanity. Look how that has worked out for us. Libertarians don’t support stuff like Dodd-Fwwwank or Glass-Stegall. Get the government out of banking, get them out of everything! You are also trusting the banks to follow the regs and the state to enforce them. So Lol there. I guess voting for Romney was fine in 2012 because he was the “lesser” of two evils and we had to “stop Obama!” Right? The FCC is immoral. They rely on stolen money to operate. Who cares which shows are on and what times? Certainly not libertarians.